Well I will be a little honest and say that benchmarks, for this class of products are rather meaningless, its not nearly as bad as what they make it look. The ZBOX Pico is not designed for high performance, but for daily workloads. The device comes pre-installed with windows 8.1 32bit, so after about 10 minutes of initial setup, we were ready to go. I wrote almost all of this complete review using this system, so I had about 5-10 tabs opened at all time, some music in the background and some images opened as well. It was a fairly satisfactory experience and no real slowdowns. Another great thing that I found with the device were great boot times, which was surprisingly quick at around 14 seconds from the time I pressed the power button to the windows home screen. Watching 1080p HD BD Rips was no problem, CPU usage stayed at around 5%-8%. Video streaming was not too bad. Streaming 1080p video on youtube was not perfect, there was a little amount of stuttering and CPU usage hovered between 70%-100%. At 720p, there were no issues what so ever. The device did get a little warm when streaming, which is specially impressive as it is completely passively cooled. Heat is at times an issue with PCs of this size, but not with the PICO. Simple HTPC: Just hook it up to your TV and a wireless keyboard and mouse and you have a full HTPC. If you think your better off with a smart TV, I would any day save that extra cost and buy one of these. You smart TV ain’t gonna say smart forever. Having a desktop running a full version of Windows OS really makes things more flexible and you can do a lot more with your TV. Browsing/Office use: It works well for simple uses like browsing, emailing, simple spreadsheets and other light weight tasks. I am sure there are users who use it for just that and with this, not only do they save on money, but with almost no footprint, they save on space as well. 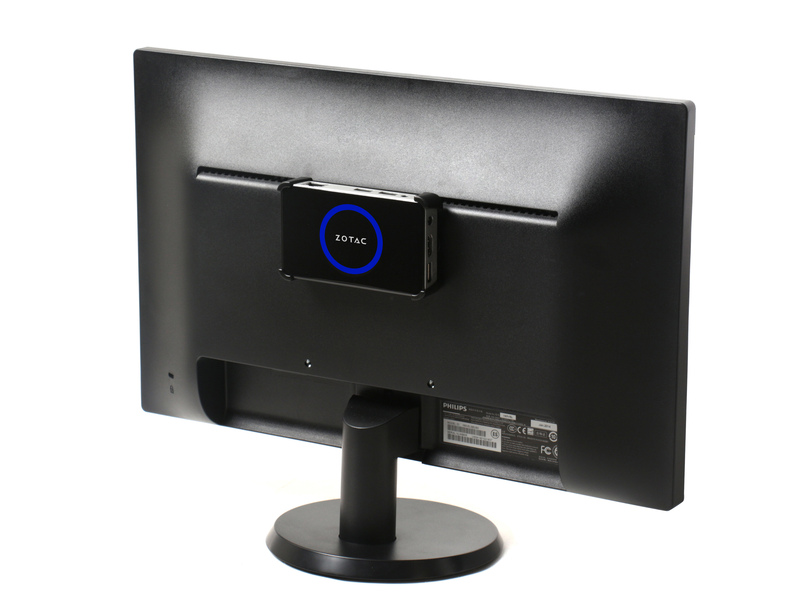 Its great for people with a home office setup, the pico comes with a mounting bracket, which you can use to mount it on to a VESA supporting monitor. Using it for MS office should not be an issue as well, as long as you don’t deal with large data sets. Downloading and streaming: Since the power consumption is really low and does a good job in media streaming, its a good option if you are a download junkie. You just need to hook it to an external USB hard drive and your good to go. Education/Programming: Its performance is enough if you are does some light programming work or for educational purpose. I am not too sure if there will be a lot of folk who would want to carry it around in their pocket, but that can certainly be done with the pico. Now that being said, there are some caveats. Very little disc space: I got the 32GB variant, which had a usable disc space of 20GB. If your not cautious, you will run out of it very quickly. You can use a mico SD card (up to 128GB) and expand the storage, but that has its own limitations. Non upgradable: This is a slight bummer, the hardware is not upgradable. You can’t add more RAM or swap the internal HDD (its flash based, embedded). I understand that the device cant support more than 2GB of RAM and that zotac can’t do anything about it as that is a platform limitation.